Your choice of Sandwich or Wrap. Your choice of ONE Salad:( Pasta OR Potato) Fruit , Dessert, Chips, and Bottled water. Honey Glazed Ham, Oven Roasted Turkey, Leaf Lettuce, Slice of Tomato, Bacon, Cheese. Honey Glazed Ham, Cheddar Cheese, Tomato, Leaf Lettuce. Roast Beef, Chedder Cheese, Leaf Lettuce, Tomato. Ham, Turkey, Roast Beef, Chedder, Leaf Lettuce, Tomato. Smoked Turkey, Smked Ham, Leaf Lettuce, Tomato, Bacon, Cream Cheese Spread. Cheese, Grilled Peppers, Onions, Tomato, Lettuce. 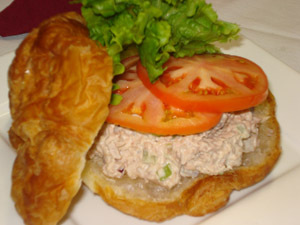 Tuna Salad, Lettuce, Tomato, Cheese on Croissant. Smoked Turkey, Red Onion, Tomato, Avacado, Lettuce, Roasted Garlic Cream Cheese Spread. Marinated Peppers, Mushrooms, Onion, Tomatos, Lettuce, Roasted Garlic Cream Cheese Spread.